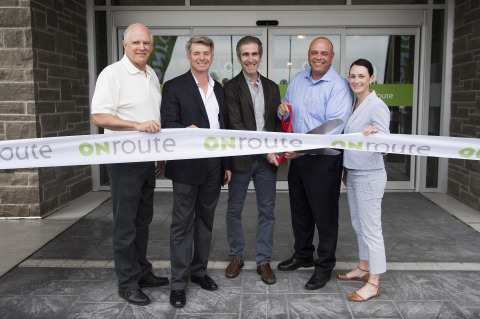 INNISFIL, Ontario–(BUSINESS WIRE)–Ontario travellers today have access to state-of-the-art amenities when travelling on Highway 400 southbound, with the official opening of the Innisfil Service Centre. This is ONroute’s 20th and last new build in a world-class system focused on traveller safety, convenience and selection across Ontario Highways 400 and 401. Today, Host Kilmer Service Centers (HKSC), the joint venture partnership between global restaurateur HMSHost and Kilmer Van Nostrand Co. Limited, celebrated this significant milestone for Ontario’s highways and the travellers it serves. The location of the new Innisfil ONroute Service Centre has replaced the Cookstown location, and is now 5 kilometers north of the previous site. A modern assortment of amenities and services are in place at Innisfil and the other 19 Service Centres to ensure travellers will have the convenience, efficiency and dining options important to them when on the road. Travellers will find healthy eating options, free Wi-Fi, comfortable dining seating, modern and accessible low waste washrooms, a two-hectare seasonal picnic area with accessible picnic tables and a year-round designated pet exercise area. Guests will find a pleasing mix of both local and national favourite brands such Tim Horton’s, New York Fries, Starbucks, Burger King and M Market. Filling up the tank and purchasing a grab-and-go item are also easily done through the Canadian Tire Gas+ full service gas station and retail facility. Canadian Tire Gas+ gas stations can be found at all ONroute Service Centres. “Kilmer is privileged to have partnered with HMSHost and Canadian Tire in the delivery of this world class network of travel centres across Ontario. Our team aspired to outstanding design that is functional, accessible and welcoming and to a complete offering for travellers that was focused on convenience and selection. We are all very proud of the finished product and the team that delivered it,” said Ken Tanenbaum, Chairman of ONroute and Vice Chairman of Kilmer Van Nostrand Co. Limited. The new Innisfil Service Centre incorporates an overall design which is similar to the other 19 ONroute locations in terms of appearance and principle, with a striking upward sloping roof and high-peaked corner, and ground-to-roof windows beneath; while the rest of the building’s external walls are wrapped in stacked natural rock. Design principles for all ONroute Service Centres embrace a commitment to longevity, accessibility, and green building practices. ONroute Service Centres are designed for 50 years of continuous use and are built to LEED (Leadership in Energy and Environmental Design) specifications. Today, 16 ONroute Service Centres are LEED Silver certified; three are LEED Gold certified. Innisfil Service Centre is designed to meet LEED Silver certification. LEED certifications are achieved through independent review of building design and construction practices, and are recognized by the Canada Green Building Council (CaGBC). Certifications were made possible by collaborative efforts between HKSC and the Province of Ontario. LEED certifications for ONroute have been achieved by incorporating numerous innovative and carefully planned design initiatives that address construction practices and natural resource usage. These factors also align directly with the goals set forth by HMSHost’s startsomewhere® sustainability initiative. Erosion and sediment control through water efficient landscaping and stormwater management provisions. Nearly all construction waste diverted from landfills. Use of low emissions construction materials. Utilization of natural daylight and energy efficient lighting. Host Kilmer Service Centres Inc. is an alliance between the world leader in travel dining and shopping and a well-recognized Canadian company with extensive experience in building public infrastructure. With over US$2.7 billion in annual sales and 33,000 sales associates, HMSHost operates restaurants and retail stores in 99 travel plazas across North America. The Company also provides travellers with dining in 114 airports worldwide, including Toronto’s Pearson International Airport and the top 20 busiest airports in North America. HMSHost is a part of Autogrill Group, the world’s leading provider of food and beverage services. With sales of €3.9 billion in 2014, the Group operates in 29 countries and employs some 54,000 people. It manages over 2,800 stores in over 1,000 global locations. Visit www.HMSHost.com. For over 40 years, Kilmer Van Nostrand has been building Canadian businesses through long-term, stable investments in areas as diverse as construction and building products, sports, cable TV and publishing, food processing and environmental rehabilitation. Kilmer seeks to be involved in projects that improve the fabric of Canada and the communities in which its infrastructure and real estate divisions, Kilmer Developments and Kilmer Brownfield operate. Through Kilmer Group’s investment in Maple Leaf Sports and Entertainment, the company has been a part of developing the Air Canada Centre and the related adjacent real estate and partnering with the City of Toronto on the operation of BMO Field and Ricoh Coliseum.